This Spirit arrived is from Brazil and is both usual and striking in appearance. Dissolution quartz are created within the Earth by the action of Earth acids through the eons … each is unique in expression and each bears a different message, bound for a specific Keeper. This lovely and prismatic wand of a Spirit is 1 lb 4.2 oz and 5.8” by 2.2” by 1.4” and she is most definitely a warrioress. You can see on the sides where she once had very pronounced Lemurian lines and they are even more so now … and blended with etchings and glyphs. Through the eons, she was also dinged and damaged, but has healed them all, clearly showing her healing power. All around her base are a number of ancient and well-healed keys, perfect to hold her as you are working with her. She would be a wonderful Spirit for a Healer or a Keeper who is going through a healing crisis. Ancient, sacred, wise – they all apply. You cannot handle her without being overwhelmed by the depth of this Spirit! This Spirit helps you to understand how all that we undergo in life, shapes our physical, emotional and Spiritual evolution. Working with her, you can determine why things happen and how they contribute to the growth you are meant to see in this Life’s Expression. 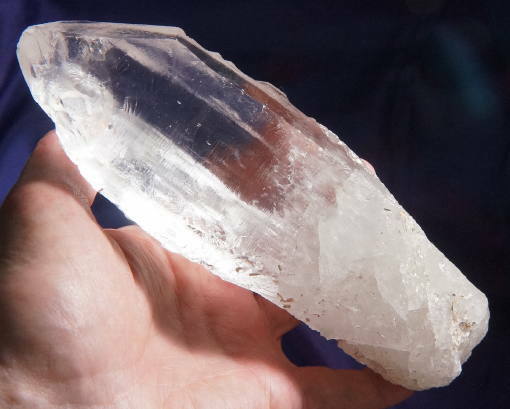 Because of the nature of her Lemurian lines, you would start running your fingers up and down them … like a xylophone. You will know her immediately and will know how to decode her wonderful records that emanate. I guarantee that if you were unaware of your destiny before meeting her, there will be NO doubt after!